School Council is the legally formed body that is given powers to set the key directions of a school. It is the major governing body of the school that, within DET guidelines, decides the future directions for the school and oversees the school’s operation. At Sandringham East, we have an active and enthusiastic School Council that meets regularly on Tuesday nights. All Councillors sit on sub-committees that consider issues around Education, Policy and Planning, Fundraising, Finance, eLearning, Community Partnerships and Facilities. The Parent & Friends Association (PFA) is also a committee of School Council. Buildings & Grounds is a Sub-Committee of School Council and has the responsibility of coordinating the safety, maintenance and upgrade of our facilities. 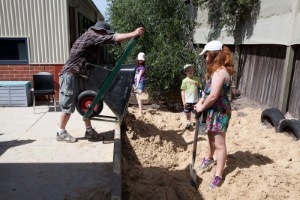 School Council employs a maintenance person two days a week which also helps in the upkeep of the school environment. Working Bees are held each month and are a great way for all families to join the SEPS community. A variety of maintenance jobs are conducted at working bees - painting, lawn mowing, pruning, cleaning, repairs, playground inspections just to name a few. There is always plenty of work to be done for anyone attending. Working bees are on Sundays from 9:00am to 11:00am. Each Level is invited once a year with a competition to see who have the highest percentage attendance rewarded with a lunch for students at the end of the year. The committee consists of The Principal, Assistant Principal, Business Manager, Treasurer and School Council members. The key purpose is to bring people together through school community involvement in "events", public relations, promotion of the school and assistance in student events as requested. Fundraising is not necessarily for profit but a by-product of "events". The funds raised through these activities are pooled into the general school budget as a whole and while the committee do not have the authority to determine disbursement, they can make a recommendation to the School Council for the use of the funds which are directed specifically to resources for students. Currently the focus is targetted to add a new playground in our school environment. School Policy is determined by School Council in consultation with the relevant section of the school community - teaching and non-teaching staff, parents and students (when applicable). Current policies are availble on this website. The role of the eLearning Committee is to implement the school’s vision to integrate digital technologies seamlessly. The committee makes recommendations on both software and hardware to be purchased and develops policies for safe and responsible use by students and staff. Communities can have a major impact on the outcomes of children and young people. Education partnerships help schools to provide different routes for different learners, catering for the diverse range of abilities and ways of understanding which learners have. The role of Community Partnerships is to promote the school’s involvement with the local community. The committee write grants for funding to ensure optimal learning resources for all students, and has recently begun a partnership with Corrections Victoria.